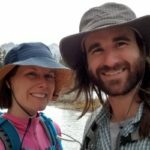 Why do you like to travel? While we enjoy traveling to witness beauty around our planet, we also really enjoy the learning aspect of travel. We find it fascinating that each place and culture has so many differences and similarities to our own home in the USA, especially the food scene! 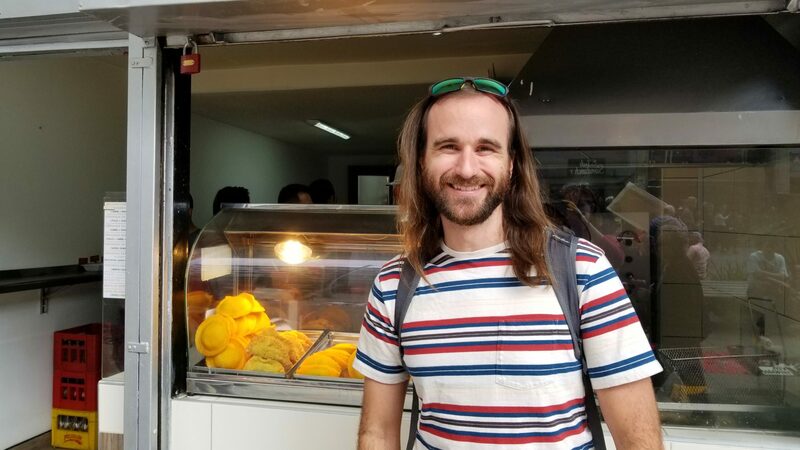 So when Jimmy found a free tour featuring Colombian food, we knew this was going to be the perfect way to dive right into Colombian culture on our first day. Thanks to our incredible tour guide, Andres, from Beyond Colombia for introducing us to Colombian food, history, and culture. You can learn more about this and other tours on their website: http://www.beyondcolombia.com/. Beyond Colombia's tour was a blast and is highly recommended! PRO TIP: As you will see below, SO MANY Colombian foods include cheese. 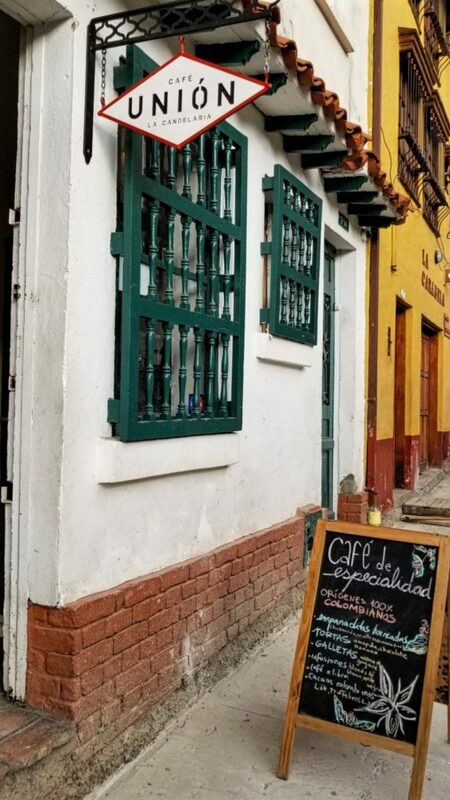 Want to enjoy the Bogota food scene? They even serve sweet desserts with cheese! If you do not or cannot eat cheese, you may see a decreased variety of food options in Colombia. Our food tour started with a favorite many of us already know and love — empanadas! In Colombia, they use cornmeal dough (yum!) filled with rice and a mix of meats including chicken, beef or pork. Then they fry the empanada and serve it with sauces. The place we went to for empanadas had several sauces — some spicy, some sweet — and we learned the proper way to eat them. 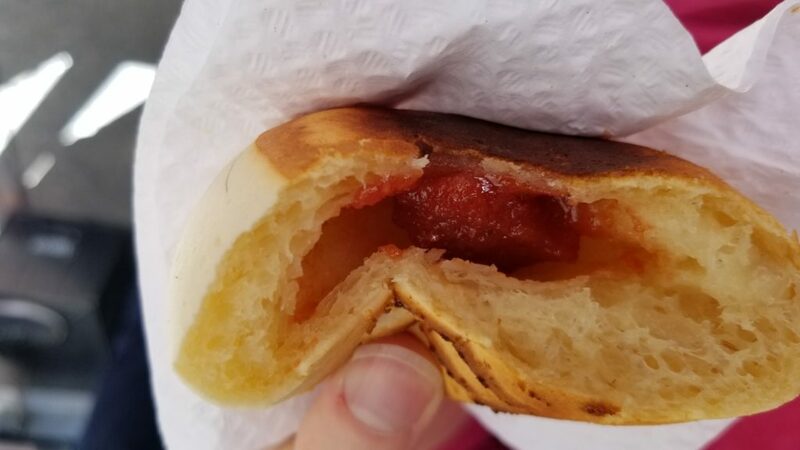 After biting one of the corners off your empanada, you fill the interior with the sauce of your choice. Here’s a picture of Jimmy after we already ate them because we were far too hungry to stop and take pictures before (oops!). 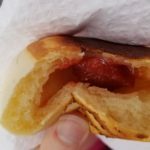 Next we tried our first pandebono, which is a cheese roll with a soft interior, crispy exterior, and can be filled with guava. While it can be served with coffee or Colombia’s favorite hot chocolate, we had ours with a cup of avena, which is a sweetened condensed milk and oat drink. Yum! Did you know that the ants they fry here are a specific type of large ant, called the Princess Ant? They only leave their colonies to create new ones once per year, on a sunny day after a lot of rain. This is because the dirt is softer and it’s easier for them to push through their tiny tunnels onto the outside. Once outside the safety of their colonies, they are captured and saved for frying. 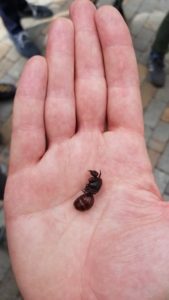 As we walked past a fried ant vendor, we bought a small package of them to share across the group. They tasted like extra-cooked popcorn, and to be honest, they were pretty good. Fried ants taste like overcooked popcorn! I love a good, hearty soup! Ajiaco soup is another Colombian classic that we really enjoyed. Made with chicken stock, corn, and potatoes, you add pieces of chicken, capers and bit of cream to your liking to complete your soup. It was SO GOOD. Another fun thing about this soup was our experience … we ate outside a private room where a men’s acapella group was dining, drinking, and singing Disney songs like “Let It Go” in Spanish. It was beautiful and entertaining at the same time. You know how I said that Colombians like cheese on everything, including desserts? We first learned the extent of this when we stopped by an oblea cart. Obleas consist of two thin, sweet wafers with your choice of toppings on the interior. 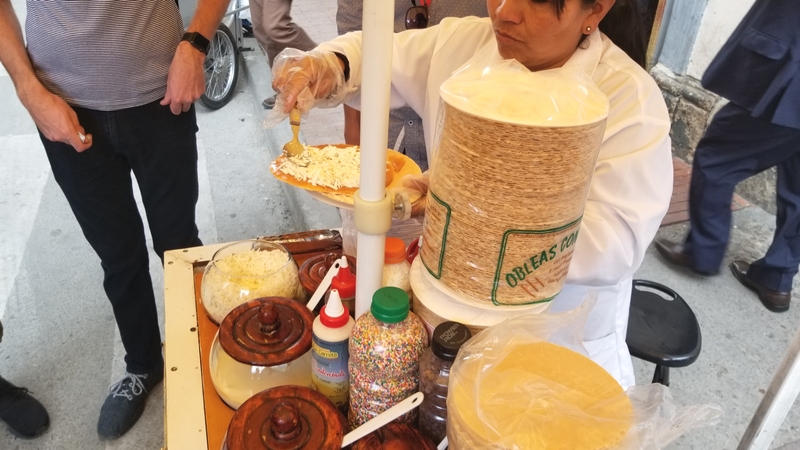 I was really excited by the filling options at this cart: caramel, chocolate chips, nuts, sprinkles, strawberry filling, shredded coconut, and more! Just kidding — they didn’t have coconut. It was actually shredded cheese. Instead of adding the fillings I knew I would like, I had my oblea in Bogota’s more traditional way: with caramel, nuts, and the shredded cheese. It wasn’t bad, but it also wasn’t caramel and strawberry with nuts and chocolate chips. Oh well! By this time, we were pretty full and even a little tired. Colombian coffee to the rescue! Colombia is well-known for their coffee exports. But did you know that almost all of its best coffee is exported? It’s really hard to find a good cup of joe in the country since they only keep the lowest-quality for themselves. Hence our excitement when we were taken to a place with the highest-quality Colombian coffee. 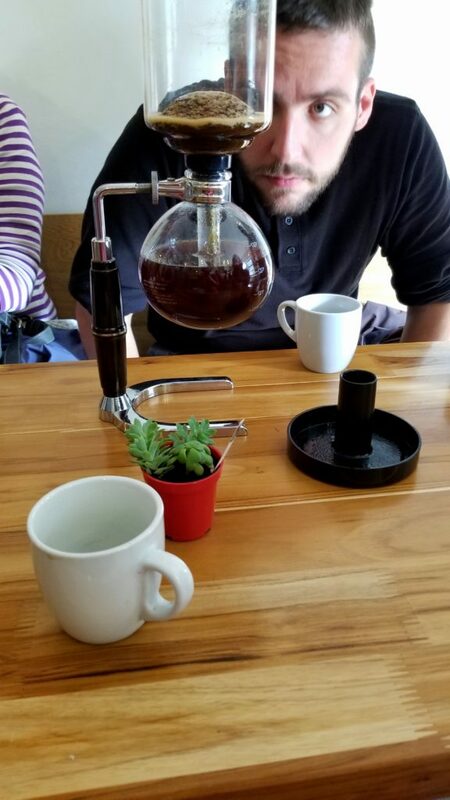 They made it two ways so we could taste the difference in preparation: with a French press and with a syphon coffee maker. Both were delicious, although we preferred the French press coffee — it was richer and more flavorful. During this time, we also had a discussion about Colombia’s past, the image it’s given them, and how Colombia is changing today. Our guide grew up in Bogota, and he gave us fascinating insight into how dangerous Colombia used to be and how it’s safer now than ever. This increased safety has expanded tourism to more areas around the country, and tourism is now their second largest economic driver — second after their beloved coffee. For our next stop, we entered a restaurant with juicy meats being grilled by the front window. Our mouths watered as we tasted these new delicacies, unsure of what they were. Once we were done, we found out that we had just eaten chigüiro (capybara) and mamona (veal from a very young cow). We also had arepas, which are made from corn flour and can be used to make sandwiches or be served with avocados, cheese, and more. Yum! Say what? Colombians love hot chocolate, even though they do not have winter. Like most of their favorite foods, this classic drink is served with slices of cheese on the side. This cheese is added to your cup of hot chocolate, similarly to how we add marshmallows. The hot chocolate itself was really good, so we decided to give the cheese a try. It was a no-go for us. Perhaps we added a little too much cheese to our hot chocolate, but it created a thin layer of grease and subdued the chocolate taste. To me, it took the joy out the sweet, chocolatey goodness that is hot chocolate, but we were glad to try it the Colombian way! Aguardiente is the Spanish translation for “fire water” and is a type of Colombian brandy. It is made with water, alcohol, sugar, and anise and has a lower-than-average alcohol content, so it’s more of a spirit. Make sure you cheers to your health before you drink it … Salud! Pin this to get a taste of Colombia! 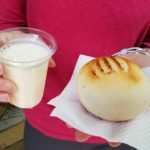 We went on a food tour in Medellin and funnily enough, except for arepa, we had completely different food. I did love how cheap and delicious the street food was. I’m curious about the capybara. I don’t think that I have ever eaten that before. What is it like? We did have the Ajiaco soup but a restaurant near Villa De Leyva. I absolutely loved the flavours in it and how healthy I felt eating it. 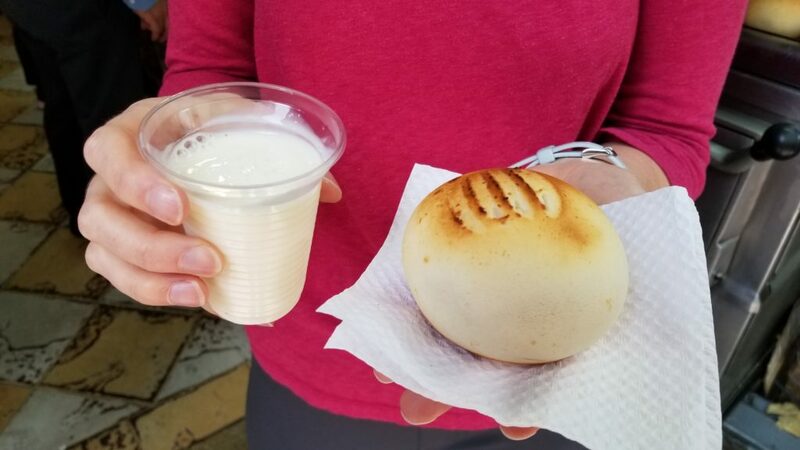 It is wonderful how different cities in Colombia have unique foods! We have been eating our fair share of street food so a healthier soup is very welcome from time to time. The Capybara tasted like pork and is an animal that is looks like a colossal guinea pig. 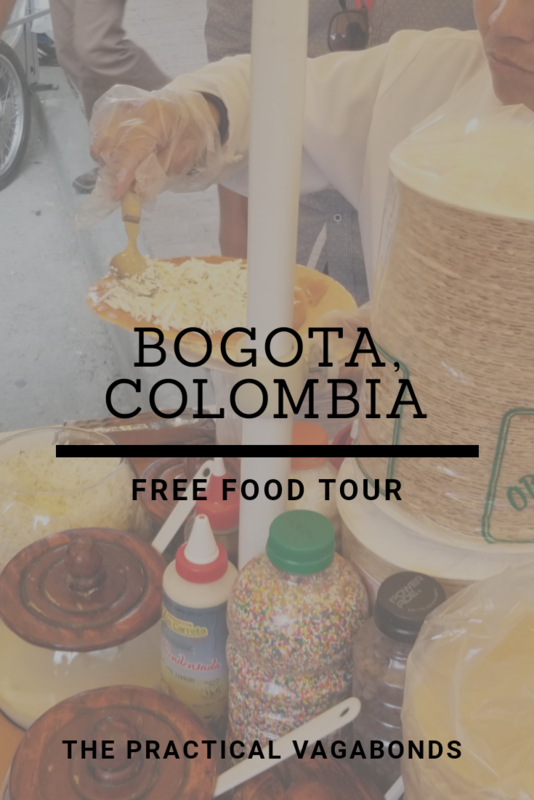 I love these free tours that are popping up every where and even better that it’s a food one in Bogota! I love trying the different versions of foods like empanadas and arepas. I really like street food you can eat by hand. I’m so glad you mentioned what the fried ants tasted like – now I’m willing to try them. We were super excited when we found out about the tour! We might do the one in Cartagena as well. The fried ants are certainly worth a taste. We heaed that they are even better when fresh. Eeek! My tummy will hurt with the fried ants but the Ajiaco soup is lovely. My ex-boyfriend who’s from Colombia made that for me once and it was delicious! The Ajiaco soup is definitely one of our favorite foods in Colombia so far. That is great you were able to try it! I like cheese with nearly everything, but I think I have to draw the line at hot chocolate and cheese?! I’ve had empanadas before, and love them. The condensed milk drink sounds strangely delicious too! I would love to visit Bogota and experience it through it’s foods. I’m a big fan of anything with cheese so I think I could get behind almost all of the offerings – except fried ants – not sure if I could bring myself to try those! But I’ll have an extra cup of coffee to make up for it! It’s a great cup of coffee, too! You will love it. I hope you get to take this tour sometime! I just love food posts! It makes me hungry AND want to visit the place 🙂 I can relate with just stuffing your face with empanadas and forget to take a picture. They are one of my favourite foods to snack on in Colombia! Never tried Oblea before, so will do that on my next visit to Colombia! Haha I am glad someone else can relate! We were really hungry! OMG! Are you telling me you can give it a try to all those tasty dishes for free? That’s the best advice eveeeer! You’re the best, guys! No problem, Maria! And the tour itself is free, but you pay for whatever food you want to try. The food was reasonably priced though, I think we only spent like $10 USD for all the food we ate that day! I love Empanadas but I never tried the Colombian version. Fried ants? I don’t think I will ever have the guts to eat them! But my hat’s off to your for trying them! Haha thank you. 🙂 They aren’t too bad, I promise! Very soon I will be going to South America and this post made me so excited:) I wanna try all of them! Yay! I’m so excited for you! You have to let me know where you are going and what food you enjoyed. I would totally double down on the Colombian coffee and likely skip the ants! Were they good? It kind of gives me the heebie-jeebies! Haha! We did double down on the coffee, and it was amazing. But you should definitely try the ants too! They taste a bit like popcorn…not too bad! Colombia is on my bucket list and your list of foods to try there makes me want to go very soon! Not sure I’ll try the fried ants though! It won’t hurt to give them a try! We actually liked them, they were very interesting. Inca Kola?!? I need to add this to my food list! Hands down the best part of travel is trying out new foods! These Colombian food have got me really hungry and I just ate breakfast. The Oblea sounds delicious although I might skip the cheese in hot chocolate. What a great food tour! Good food is one of the best parts of life! And I don’t blame you about the cheese and hot chocolate. I’m still scratching my head about that one! Pandebono!!! I haven’t tried it, but your description sounds like I really need that in my life! 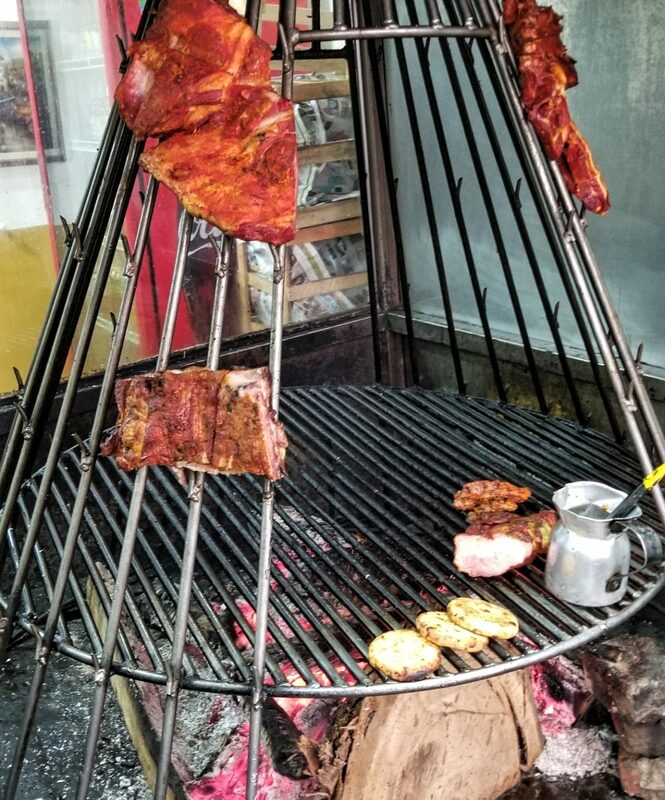 🙂 Thanks for sharing – will know what food to look for in Colombia! Pandebono is soooo good! 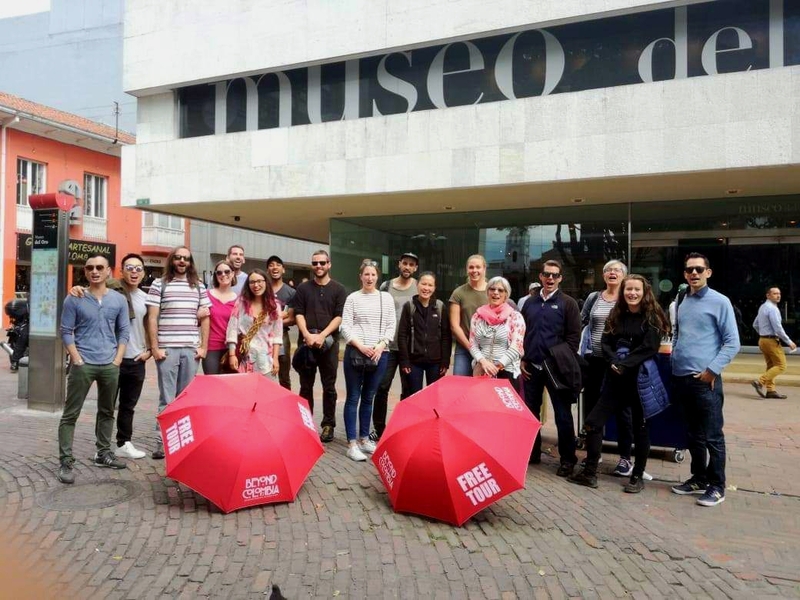 Definitely check out this free food tour — we loved it. I love how diverse the food is! While some of these look wonderful, I’m not sure I could do the fried ants! Get this — we met someone who snacks on fried ants like we eat popcorn! Similar flavor profile, I guess! 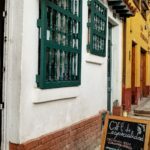 Wanted to visit Colombia, your post has a helpful list of cheap eats which I usually do. But not sure if I can fried ants. Woah Fried Ants – In the Chhattisgarh state of India the tribals make a chutney out of red ants!! I remember eating a Fried Cricket in Myanmar!! What a curious food tour! I am sure it must be fascinating trying all these recipes. wow, a free food tour? Anything involving food makes the trip better. I will love to take a taste of yummy colombian food. all the food sounds and looks delicious. Im not sure about the fried ant thought. So is it like the whole colony depend on that one ant but it gets fried instead? Im a big foodie so this list helps. But it’s a no for the ant. We haven’t! We are in Colombia a couple more weeks, so we’ll have to seek it out. Thanks for the tip! Hot chocolate and cheese sounds like an interesting combination haha. Empanadas are my favourite, I can eat them anywhere, anytime. Fried ants??!!! Oh my god, I cannot even imagine what that’d be like (overcooked popcorn doesn’t sound very exciting haha) but I would love to give it a shot anyway for the sake of trying a unique local dish. I would not try the ants, even though I adore popcorn, but the rest seems really nice. And did somebody say cheese? Yes, please! I’ve never been in Bogota but it’s on my list! I have a couple of friends from there and would really like to visit. And this list is awesome. I didn’t know that Colombia has empanada as well. And those fried ants…lol. are they tasty? The ants weren’t bad! They taste somewhat similar to popcorn. We heard that when they are first caught and fried they are much better. Wow, I have never seen those huge ants, so found this paragraph about how they captured and how they taste very informative! I loved your free Bogota Food Tour maybe I will not taste all the things being vegetarian but would love to check that Columbian Coffee. Thanks for sharing some great joints for hot chocolates, coffee and cheese at Bogota. 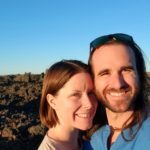 We will definitely be visiting Bogota in the next couple of years and we love to try new food when travelling, so loved reading this! Great to hear about this food tour – will look out for it when we go. Totally up for trying the fried ants. LOVE empanadas so will look forward to that! It is interesting to know Colombian food.. oh.. and fried ants are really strange for me. Local food dishes are also reflections of cultural diversity.. and you have beautifully presented it.. I would be with you in exploring the culture when traveling and food forms a big part of our travels too. We have sampled different cuisines and prefer to go local. Thoroughly enjoyed learning about Colombian food here. I think I will also have that happy look after eating Empanada 🙂 Fried Ants.. Hmm. Have tried worms in Bangkok but this one would be the first time! And Colombian Coffee is a must! Would want to bring some back. 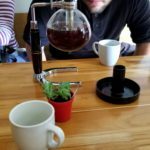 I’ll be visiting Bogota soon and this post made me even more excited:) Looking forward to trying all of these! Everything looks and sounds so good but the fried ants! I just couldn’t do it! Thanks Becca! We’ll check it out. Sounds like we ha similar food tastes!